Whether assessing or treating acute or chronic pain syndromes, pain management should include a biopsychosocial approach. Assessment may include a focused joint and functional examination including more global areas of impairment (i.e. gait, balance, and endurance) and disability. Cognitive behavioural therapy (CBT)can be described as the "gold standard" psychological treatment for individuals with a wide range of pain problems. It can be used alone or in conjunction with medical or interdisciplinary rehabilitation treatments. Chronic pain stands-out as the most common condition treated with CBT. The reason for this, as the Institute of Medicine (2011) explains, is because chronic pain is a condition influenced by biological, psychological, and social factors and is optimally managed by treatments that address not only its biological causes but also its psychological and social influences and consequences. Since the introduction of the biopsychosocial model, treatment for chronic pain has become multimodal and multidisciplinary, with emphasis on a range of strategies aimed at maximising pain reduction, improving health-related quality of life, independence and mobility, enhancing psychological well-being and preventing secondary dysfunction. As time goes by, a patient with pain can develop behaviours, such as pain catastrophizing (magnification of the threat of, rumination about, and perceived inability to cope with pain), as well as fear-avoidance (activity avoidance due to fear of increased pain or bodily harm), which have consistently been found to be associated with greater physical and psychosocial dysfunction, even after controlling for pain and depression levels (Edwards, Cahalan, Mensing, Smith, & Haythornthwaite, 2011; Quartana,Campbell, & Edwards, 2009; Gatchel et al., 2007; Leeuw et al., 2007). Many individuals with chronic pain have mood, anxiety, and sleep disorders (Alsaadi, McAuley, Hush, & Maher, 2011; Demyttenaere et al., 2007; Gore, Sadosky, Stacey, Tai, & Leslie, 2012; Tsang et al., 2008), and CBT can also be used to treat these conditions. There is no standard protocol for cognitive behavioral therapy. It varies in the number of sessions and specific techniques that often include relaxation training, setting and working toward behavioral goals (typically including systematic increases in exercise and other activities), behavioral activation, guidance in activity pacing, problem-solving training, and cognitive restructuring (Thorn, 2004; Turner & Romano, 2001). Currently, CBT is the prevailing psychological treatment for individuals with chronic pain conditions such as low back pain, headaches, arthritis, orofacial pain, and fibromyalgia. CBT has also been applied to pain associated with cancer and its treatment. Although there are no cures, a combination of psychological and physical therapies appears to provide significant benefits. When pain persists in spite of medical treatment, as is the case in chronic pain syndromes, the issues become even more complex. A person who has pain, especially on movement, tends to avoid doing things that provoke their symptoms. They rest but unfortunately this is not a helpful treatment as it leads to secondary stiffness and weakness, causing worsening of the symptoms the individual is trying to avoid. Inability to function leads to a loss of role and self-esteem with the progressive intrusion of other problems such as financial hardship and strained relationships. In essence, cognitive behavioural approaches aim to improve the way that an individual manages and copes with their pain, rather than finding a biological solution to the putative pathology. 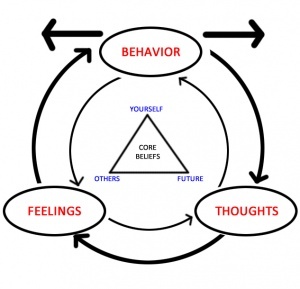 With appropriate instruction in a range of pacing techniques, cognitive therapy to help identify negative thinking patterns and the development of effective challenges, stretching and exercising to improve physical function, careful planning of tasks and daily activities, and the judicious use of relaxation training, many people find the treatment enables them to take back control of their lives, to do more and feel better. While the cognitive elements of the programme are usually addressed by psychologists, other staff working alongside, such as physiotherapists, occupational therapists, nurses and doctors, are required to improve their psychological understanding and skills to enable them to contribute to the treatment programme. For example, an exercise programme run by a physiotherapist will adopt a cognitive approach by ascertaining the person's fears and beliefs about the movement or activity they are undertaking. Frequently this will demonstrate that the person's caution relates to fear of damage. Such an approach will move the person on both physically and psychologically in a way that coercion alone will never achieve. The system integrated within the Quebec classification system (Spitzer, 1987) and represents a multilevel patient-centred clinical reasoning approach to broadly classify and target management for patients with back pain is called classification-based ‘cognitive functional therapy’ (CB-CFT). It directly challenges these behaviours in a cognitively integrated, functionally specific and graduated manner. Cognitive functional therapy (CFT) is a client-centred approach to management that targets the beliefs, fears and associated behaviours (both movement and lifestyle) of each individual with back pain. This approach focuses on changing patient beliefs, confronting their fears, educating them about pain mechanisms, enhancing mindfulness of the control of their body during pain provocative functional tasks, training them to reduce excessive trunk muscle activity and change behaviours related to pain provocative movements and postures. It leads the person to be mindful that pain is not a reflection of damage – but rather a process where the person is trapped in a vicious cycle of pain and disability. It is strongly behaviourally orientated and explores different movement options using visual feedback in order for people to reestablish their body schema and relearn the basic building blocks of relaxed normal movement. It empowers the person to do the very things they fear and / or avoid, but in a graduated relaxed and normal manner. It conditions them if they are weak. It motivates them to engage with exercise and active living based on their preferences and goals. This approach is great for management of chronic disorders as it aims to build self-efficacy, confidence, and adaptability while providing hope and opportunity for change for the person with pain in a person-centred manner. The CFT intervention includes comprehensive one-to-one interviewwhich involves listening to the full patient story regarding their pain and it is targeted to meet the patients’ individual needs as well fulfilling the physical examination requirements by the treating physiotherapist. The patient is encouraged to discuss their level of fear of pain and any avoidance of activities, work and social engagement. Then, their beliefs and goals regarding management of their disorder will be ascertained. The physical examination involves analysis of the patient’s primary functional impairments (e.g. pain provocative, feared and/or avoided movements, and functional tasks), in order to identify maladaptive behaviours which include muscle guarding, ‘abnormal’ movements and postures, avoidant patterns and pain behaviours. They will also be assessed regarding their level of body control and awareness (body perception), as well as their ability to relax their trunk muscles and normalise pain provocative postural and movement behaviours, and the effect these on their pain. Traditional medicine is strongly rooted in a biomedical model, which assumes that injury and pain are the same issue. Therefore, an increase in pain means increased tissue injury and increased tissue issues lead to more pain. 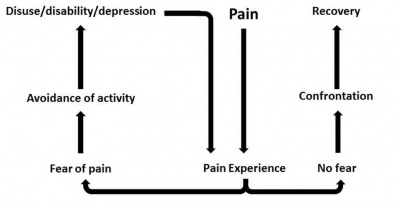 This model (called the Cartesian model of pain) is over 350 years old, and it's incorrect. Words like "bulging," "herniated," "rupture" and "tear" increase anxiety and make people less interested in movement, which is essential for recovery. This is especially important when pain persists for long periods. Most tissues in the human body heal between 3-6 months, but it is now well established that ongoing pain is more due to a sensitive nervous system. In other words, the body’s alarm system stays activated even after tissues have healed. Over the last 10 years, a research team from International Spine and Pain Institute and Therapeutic Neuroscience Research Group has explored one such potential cause and set in motion a variety of research projects aimed at teaching people more about pain. Learning the biological processes of pain is called neuroscience education (the science of nerves). Therapeutic Neuroscience Education changes a patient’s perception of pain. With TNE, the patient understands that pain may not correctly represent the health of the tissue, but may be more due to extra-sensitive nerves. Simply stated, they understand they may have a pain problem rather than a tissue problem. This neuroscience view of sensitive nerves versus tissue injury allows for a new, understandable view of treatments aimed at easing nerve sensitivity, such as aerobic exercise, manual therapy, relaxation, deep breathing, sleep hygiene, diet and more. EmbedVideo was given an illegal value for the alignment parameter "width". Valid values are "left", "center", or "right". Importantly, a multidisciplinary approach to pain management provides benefits to patients, healthcare providers and society as a whole. The integration of multiple treatment modalities, including behavioural modification therapy, has resulted in considerable improvements for patients suffering from chronic pain in terms of a reduction in the use of medications, improved functional ability, increased likelihood of returning to work, improved quality of patient care and patient satisfaction, as well as reducing healthcare costs [Cassisi et al. 1989; Deardorff et al. 1991; Kames et al. 1990; Flor et al. 1992; Chen 1996; Luk et al. 2010].